Eggplant is one of those foods that is terribly misunderstood. This relative of the tomato and the potato is actually a berry and not a vegetable. Of course, this berry is not sweet or really suited to be eaten raw. Properly cooked it is a great addition to many dishes and naturally high in fiber and low in calories making it a great, healthy alternative to many things. The natural meaty texture makes eggplant a good alternative to meats and allows you to make hearty dishes that are low in fat. Eggplant comes in several different varieties and fortunately, you can now get many of these anywhere. American: The most popular variety is the purple pear-shaped kind. Italian or Baby: Smaller and more delicate than the American Variety. Asian: Thin-skinned with fewer seeds, this type is long and slender. Sicilian: Large, round and irregularly shaped, these are the sweetest and mildest. White: Tough, smooth skin with a firm flesh. To select a good eggplant look for one that feels a little heavier than it looks with a glossy, even color. Avoid eggplants with soft or brown spots. The eggplant should feel firm and bounce back when you press on it. Eggplants become bitter with age. This is the number one complaint about eggplants. Try getting the freshest eggplants you can and store them, uncut and wrapped in the refrigerator. The longer you keep it the more bitter and unpleasant it will become. To reduce the bitterness of eggplant, cut it to the size and shape you want and soak it for about an hour in a light salt water mixture. This will draw out the bitter flavor and lightly season it before you cook it. If you have a large or older eggplant soak it for about 2 hours. Grilling eggplant adds a great smoky flavor. Eggplant quickly and easily absorbs the flavors it comes in contact with so watch how you season and cook it. To begin with, eggplant will start turning brown the second it is cut. While this won't affect the flavor it does change the appearance so wait until the last second to cut it. 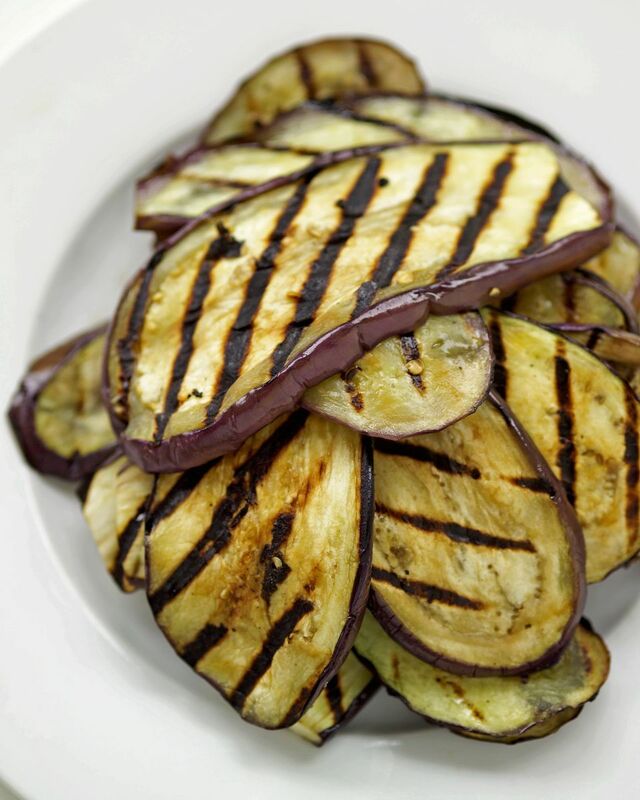 For grilling, it is best to cut small eggplants lengthwise into halves or quarters depending on the size. Larger eggplants should be cut crosswise to a thickness of about 3/4 inch. Now, lightly brush with oil and season to your liking. Eggplant can absorb a lot for liquid so go easy on the oil or you'll end up with an oily sponge. Don't be afraid to add strong flavors to eggplant, especially if you are going to be adding it to another dish. Finally, grill eggplant pieces for about 8 to 10 minutes turning occasionally. Eggplant usually holds together well on the grill so don't be too worried about it falling apart. The heat should be medium-high and remove the eggplant when it is well browned and tender. If you want a really great eggplant to treat you will definitely want to try making baba ghanoush.